It's another guest post from one of my Blogger friend Nisha. 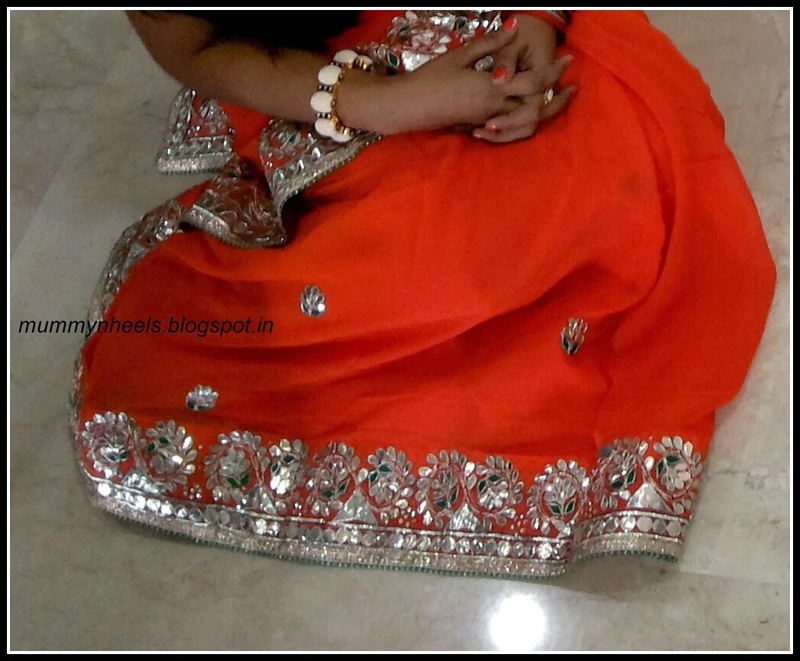 When I told her that it's So-Saree's Anniversary, and I would like her to do a guest post, she readily agreed to do this post for me in a Saree. Thank you Nisha. You are a sweetheart. Nisha sent this virtual cupcake for So-Saree's Anniversary. Aaww..! A very Happy Blog-Anniversary to you Dear! "So-Saree" is not just about sarees. But today I am here to talk about Saree. I was excited when Aditi asked me to do a guest post, that too featuring something that I am really fond of. Saree is universally accepted as the sexiest piece of clothing. If draped appropriately, it gives you the much required oomph! I have been a fan of Saree since my early teens. This 6-meter fabric has always impressed me and never let me down on any occasion. Don't know how, but draping a Saree came naturally to me. Be it cotton, chiffon, net, crepe, tussar, silk, chanderi or georgete, I love how each fabric had its own charm and how it gracefully falls on the person wearing it. The majestic saree has undergone drastic changes over the course of time and I am so loving it. Dhoti sarees- Help you achieve the Indo-Western Look. Lehanga Sarees- Is a perfect mix of modern & contemporary style. It's stylish, ready to wear & hassle free! Energizing the saree revival are a handful of young designers like Masaba Gupta, Shiven & Naresh, Gaurav Gupta and Amit Agarwal. They are reinterpreting the millennia-old grab for a new generation of stylish women. In the pics below, I am wearing a Georgette Saree which I got from Jaipur. It has beautiful gota work done it by the local craftsmen and I love its color. Nisha and her Husband posing together. Thank you so much Nisha for this post. You look gorgeous in that Saree, and that gota work is simply awesome. I really love the way you have styled it. Way to go girl. 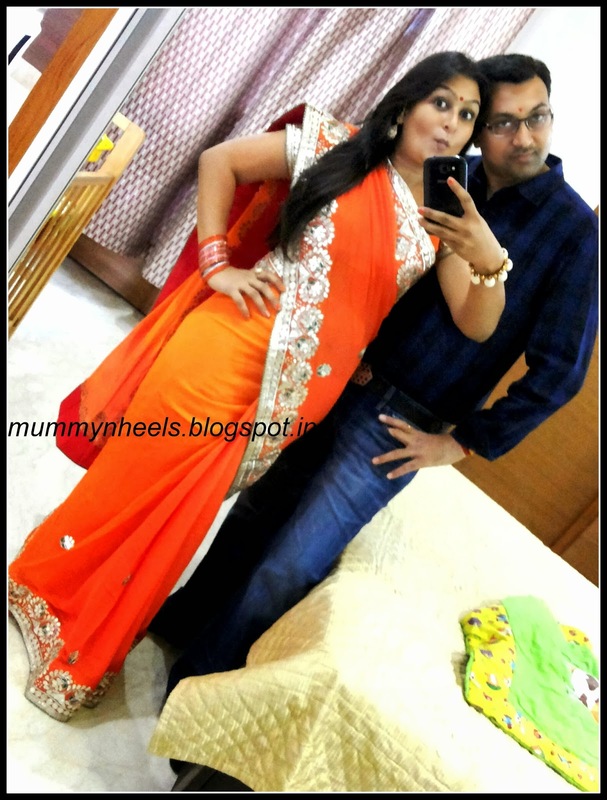 Nisha blogs on Mummy N Heels. Do check her blog out. So-Saree's First Anniversary Celebrations are still on. And we are blogging non-stop for a whole month. Cheers! Nisha looks so beautiful!!! Happy Anniversary Aditi !! I loved your concept of having a post every day for blog anniversary. Wishing you many more. Thank you Aditi for the lovely words... U rock gal...! Thank you everybody for all the lovely comments !!!!! Nisha you look beautiful. Loved your saree.